This is our first litter, that we choose to call "Blue litter". The common theme is the blue colour, since all the kittens are blue. 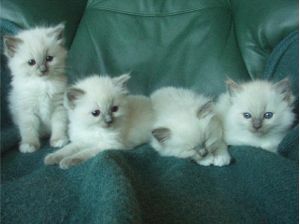 As all of our kittens this litter have got their names from the Eurovision Song Contest (ESC). 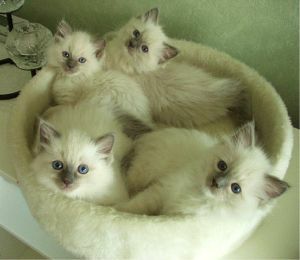 The litter contains two blue mitted girls, "Lady Alpine Blue" [Russia 2001] and "Volare" [Italy 1958]. The song "Volare" is actually named "Nel blu dipinti di blu" but more known by the name "Volare". The blue colourpoint girl is named "L´amour Est Bleu" [Luxembourgh 1967]. Last but not least we have a blue colourpoint boy "Johnny Blue" [Germany 1981].